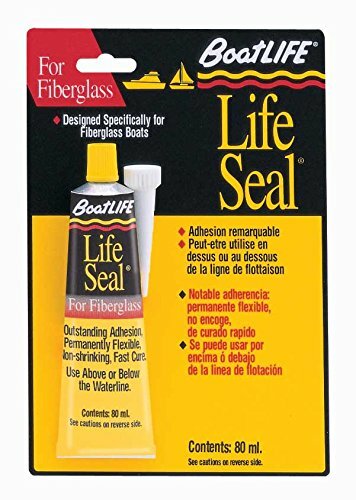 LIFE SEAL ADHESIVE SEALANT is designed specifically for fiberglass boats. A fast-curing (24 hours) polyurethane/silicone adhesive sealant. Permanently flexible, non shrinking. Outstanding adhesion to fiberglass, glass, plastic and wood. Latest technological marine sealant. Fast skinning (10 minutes). Use above or below waterline. Color: Clear. Cartridge. A unique combination of marine silicone and polyurethane, formulated especially for fiberglass. LifeSeal offers a fast-curing, low odor, high adhesion, non-sagging, non-corrosive, non-yellowing formula. It provides a durable permanent watertight seal for joints subject to structural movement. May be used above and below the waterline. Use for sealing decks to hulls, thru-hull fittings, vinyl ports, sealing/glazing windshields and bedding marine hardware. Will adhere to metal, glass, wood, Lexan, ABS and certain other materials. Can be removed without damaging gel coat. Cures in presence of water. Mildew resistant and acid free. A unique combination of marine silicone and polyurethane, formulated especially for fiberglass. LifeSeal offers a fast-curing, low odor, high adhesion, non-sagging, non-corrosive, non-yellowing formula. It provides a durable permanent watertight seal for joints subject to structural movement. Use for sealing decks to hulls, thru hull fittings, vinyl ports, sealing/glazing windshields, and bedding marine hardware. Will adhere to metal, glass, wood, Lexan, ABS, and other materials. Not recommended for ferrous cement hulls, impregnated wood, or oil soaked materials. Cures in water. Mildew resistant and acid free. 3 oz. tube, White. LIFE SEAL ADHESIVE SEALANT is designed specifically for fiberglass boats. A fast-curing (24 hours) polyurethane/silicone adhesive sealant. Permanently flexible, non shrinking. Outstanding adhesion to fiberglass, glass, plastic and wood. Latest technological marine sealant. Fast skinning (10 minutes). Use above or below waterline. Color: White. Cartridge. MARINE SILICONE RUBBER adheres to fiberglass, glass, metal and wood. Stops leaks and waterproofs. Seals ports, thru-hull fittings, hatches, windows, topside fittings. New, low odor "De-Skunked" formula. Superior adhesion. Not intended for continuous underwater use. Color: Clear. In Cartridge. 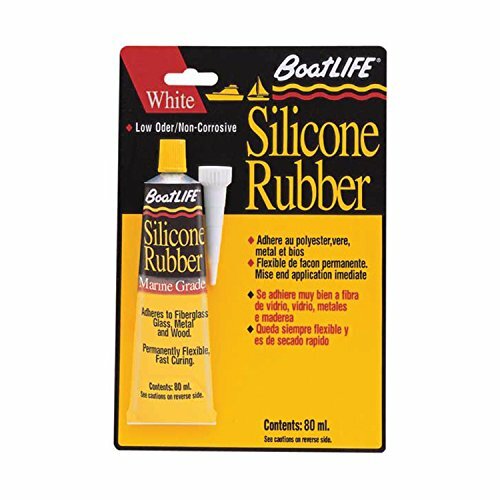 LIFE SEAL ADHESIVE SEALANT is designed specifically for fiberglass boats. A fast-curing (24 hours) polyurethane/silicone adhesive sealant. Permanently flexible, non shrinking. Outstanding adhesion to fiberglass, glass, plastic and wood. Latest technological marine sealant. Fast skinning (10 minutes). Use above or below waterline. Color: Clear. In Tube. Polyurethane & silicone combination formulated especially for fiberglass. Fast-curing low-odor high-adhesion non-sagging non-corrosive non-yellowing formula. Provides durable permanent watertight seal for joints subject to structural movement. Remove without damaging gel coat. Adheres to metal glass wood Lexan ABS etc. Mildew-resistant acid-free. Boat Life 1171 Designed Specifically For Fiberglass Boats. A Fast-Curing (24 Hours) Polyurethane/silicone Adhesive Sealant. Permanently Flexible, Non Shrinking. Outstanding Adhesion To Fiberglass, Glass, Plastic And Wood. Latest Technological Marine Sealant. Marine Caulking~ Which One Do I Use?